The Emulex 8GB Dual-Port for System x servers is a part of a family of high-performance 8GB Host Bus Adapter (HBA) solutions. These HBAs deliver exceptional performance with unsurpassed robustness, reliability, and performance for a wide spectrum of server, storage, and system area networks (SANS). 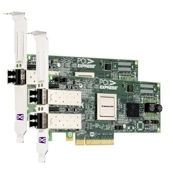 These adapters broaden the IBM 8GB HBA portfolio for System x servers. IBM System Storage DS3400 Model 41E Storage DS3400 Model 41X Storage DS3400 Model 42E Storage DS3400 Model 42T Storage DS3400 Model 42X x3200 M2 X3250 M2 X3250 M3 x3350 x3400 x3450 x3500 x3550 x3550 M2 x3630 M3 x3650 x3650 M2 x3655 x3755 x3850 M2 x3950 M2.